Joe Pavelski cards don't get a lot of love in the hobby. Probably less than they deserve. One of the NHL's top goal scorers, a stat that often draws a lot of attention with fans and collectors, Pavelski continues to slip largely under the radar. And while his cards will likely never command huge amounts, his ability to find the back of the net leaves some room for potential growth. Shop for Joe Pavelski rookie cards on eBay. 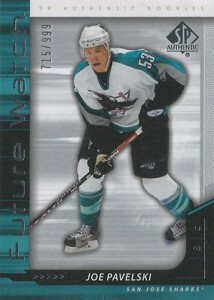 Joe Pavelski rookie cards can be found in ten sets from 2006-07, a year headlined by Evgeni Malkin. This is actually a fairly low number. Making them more accessible to collectors is the fact that none have exceptionally low print runs. Also, few have other premium elements like autographs and memorabilia incorporated into them. Pavelski has been a consistent scorer for the San Jose Sharks for several years. Twenty goals a season is a given. However, the last few seasons, he's emerged as a premier scorer. Pavelski broke the 40-goal plateau for the first time in 2013-14. Despite his strong play, there are a couple of things that will likely hold back his overall appeal in the hobby. The first is age. He's breaking out in what's likely the second half of his career. This will make it very tough for him to pile up the type of career numbers required to become a part of the hockey card elite. On top of this is the fact that the Sharks have consistently underachieved in the postseason. Not only do collectors like winners, but a deep run in the playoffs would allow Pavelski to showcase his talents to national audiences, something that doesn't happen very often playing on the west coast. This is one for those who prefer portraits over action shots. Numbered to 999, supply is somewhat limited but it's still not overly difficult to find. Be A Player isn't a brand that's held in the highest regard and is usually noted for its focus on autographs than base cards. Beehive has a storied history in the hobby. 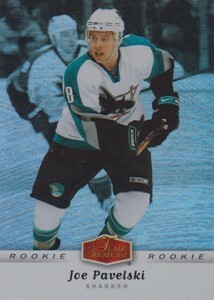 Unfortunately, for this Joe Pavelski rookie card, it's focused more on vintage premiums than modern hockey cards. 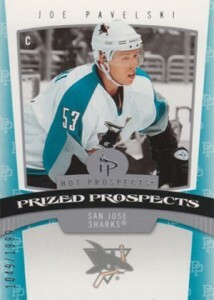 Not numbered and not overly attractive, this is one of the Sharks sniper's least desirable rookies. The revived Flair Showcase brand doesn't have the same prestige as it did about a decade earlier. Available only in special update packs, it's one of the more valuable Joe Pavelski rookie cards despite its lack of serial number. While many of the top rookies in 2006-07 Hot Prospects come with autographed jersey cards, Pavelski is one of those that fall on the much plainer side. Not only does it lack the premium elements but it has a high print run of 1999 copies. 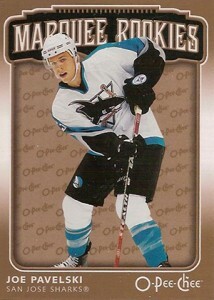 Part of the Marquee Rookies subset in 2006-07 O-Pee-Chee Hockey, Joe Pavelski is a short print. But it's still one of his most affordable and readily available rookie cards. This is the first O-Pee-Chee set issued after the classic hockey brand was acquired by Upper Deck. This would have been a much more desirable card if it was autographed as that's a big part of the brand's identity. For whatever reason, Pavelski wasn't among those to get the autograph treatment. And while it's still one of his top rookie cards, a lot of collectors probably wonder what might have been. You can never go wrong with Upper Deck Young Guns rookie cards. Although not serial numbered, it is a short print. It's readily available but widely traded as well. Since the Young Guns went to a short print format, they've emerged as some of the top cards for player collectors, rookie card collectors and set builders. 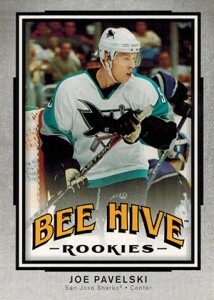 Numbered to 599, this is one of Joe Pavelski's rarer rookie cards. And it's that print run that gives it the majority of its appeal. Artifacts is traditionally driven by memorabilia and autographs with the numbered rookies taking secondary billing. 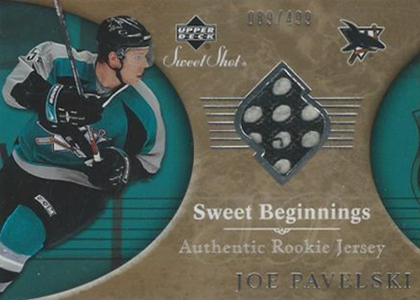 Outside of The Cup, 2006-07 Upper Deck Sweet Shot Hockey is the only set to have a memorabilia swatch as part of a Joe Pavelski base set rookie card. Numbered to 499, it's also his second rarest rookie card. 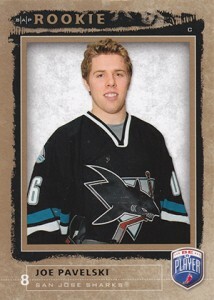 The 2006-07 Upper Deck The Cup Joe Pavelski is his most valuable rookie card and it's not even close. Numbered to 249, it's his rarest rookie base card. It's also the only one to have an autograph. And the only one with a patch swatch. To top things off, The Cup is held in the highest of regards when it comes to high-end cards.While you're not looking at paying thousands like a lot of superstars, you could probably buy one of each of all Pavelski's other rookie cards and still pay less than you would for one of these. 2015-16 O-Pee-Chee "Patches" (San Jose Sharks) SP Card # P-31 Joe Pavelski! 2015-16 UD Ultimate Collection Joe Pavelski Jersey 199!